We are delighted to announce a new service! Offsite backup software with an integrated Online Backup service! Free 30-days trial version! 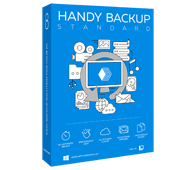 Handy Backup Online keeps all your important documents in perfect security. Our Data Center is located in secured underground shelter in USA, in a distributed storage system monitored by highly-skilled professionals. Moreover, our program supports backing up via SFTP to send files from your computer to remote servers using strong encryption. This lets you always be sure that your data is safe!